Let’s get started. Follow the step-by-step instructions. Example: A vendor/subcontractor perform work on our behalf, we deduct 20% of the bill amount as Retention when we pay them. This is to protect us from any potential liability out of their faulty work. How do I record it in Quickbooks? For Category Type, select Other Current Liabilities. For Detail Type, select also Other Current Liabilities. For the Name, enter Subcontractor Retainage Payable. For the description, enter same as Name or something like 20% withheld from subcontractor payments. In this example: Subcontractor bill is $10,000; pay them $8,000 and retain $2,000 for 4 months. Select Expenses, Check or Bill under Vendors heading. Select your subcontractor as a vendor. Fill out the remaining fields of the vendor invoice. Select COGS or expense account under Account tab. (line 1, amount = $10,000). Line2, select Subcontractor Retainage Payable account, enter negative amount (example = -$2,000). The total amount should show $8,000. 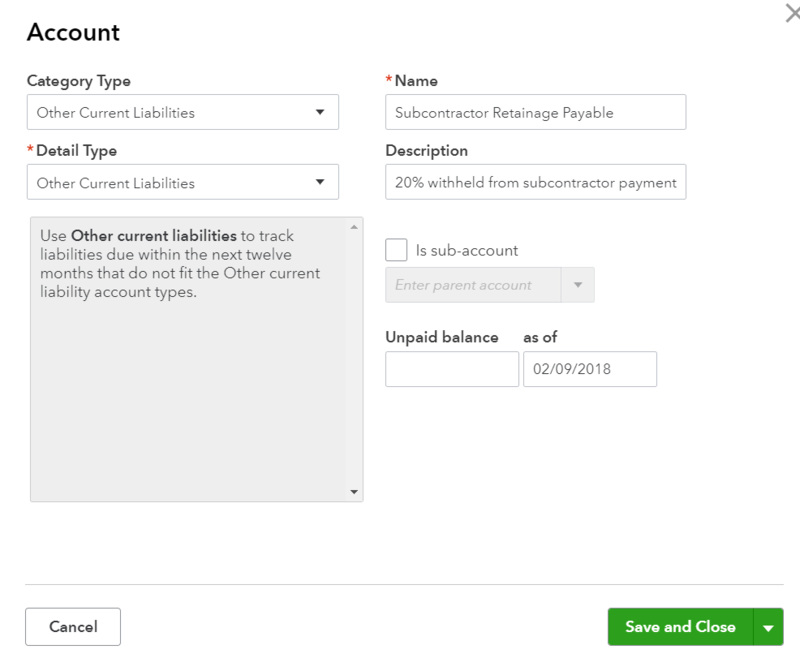 In the Chart of Accounts, locate “Subcontractor Retainage Payable” account line. Row/Columns at the top left, change “Group by” to Vendor (especially if you have multiple vendors with retainage balances). 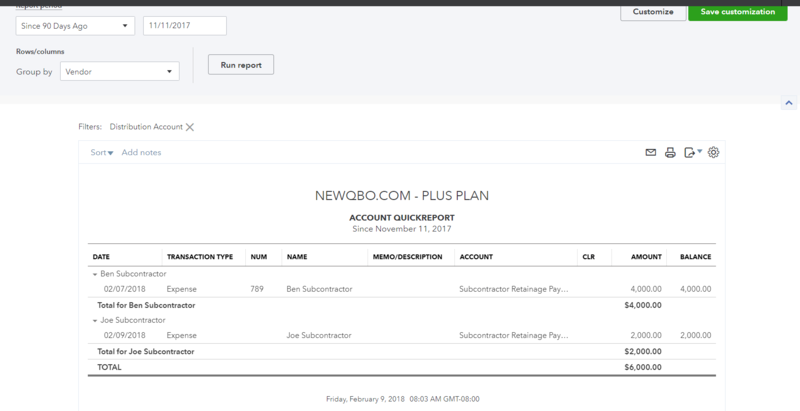 This report will give account details by vendor balances. Since you will need to track these retainage activities, click “Save customization” green button, located in the top-left corner of the report window and name it “Subcontractor Retainage” report and Save. Now, you have saved this report for future use. Next time, when you want to run this report (Dashboard > Reports > Custom Reports tab > locate Subcontractor Retainage report and run the report). Same as to enter vendor expense bill as above (step #2). For an account, use Subcontractor Retainage Payable account. Example, $2,000. That will clear the account but do the account analysis on a regular basis. Follow step#3 above on how to run report. For “How to handle customer retainage retention in QBO” click HERE.